Alonso impressed in his first official outing in the famous red of Ferrari. (CNN) -- Spain's Fernando Alonso produced the fastest time in official testing in Valencia on Wednesday in his first outing since joining Ferrari this season. The two-time world champion attracted a home crowd of over 30,000 to the Ricardo Tormo circuit and did not disappoint in his 127-lap stint. The 28-year-old from Oviedo set a fastest time of the week of one minute 11.470 seconds to put down an early marker ahead of the start of the Formula One season next month. New teammate, the returning Felipe Massa, set the fastest time in the first two days of testing in one minute 11.722 seconds as he returned to the track after his horror crash last season. Alonso cautioned not to read too much into the early results but was delighted by his incredible following for a test session. "It was a very emotional day, very special because it's also my father's birthday. 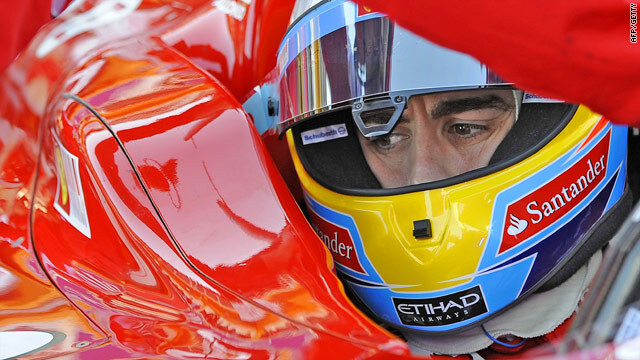 These past few days I have been really anxious to get into the car," Alonso told gathered reporters. "We expected a lot of people. But it's one thing to expect, it's another to see them there in the stands. Each time I went onto the track I could see how excited they were." Fellow Spaniard Pedro de la Rosa was second fastest in the Sauber, with seven-time world champion Michael Schumacher third best in his Mercedes, just over 0.8 seconds down. Schumacher is returning after a four-year retirement and has also attracted a big following in Spain. Wednesday marked the first time on the track this year for reigning world champion Jenson Button, the Briton nearly two seconds adrift but only completing a handful of laps as he made adjustments to the cockpit on his McLaren. F1 rookies Nico Hulkenberg and Vitaly Petrov, also made their test debuts for Williams and Renault respectively.